Here's something a bit unsettling. About a year ago I was driving home from work and noticed a TV news crew, half a dozen police cars and search dogs scouring this marshy area. (This marshy area is next to a heavily travelled road (Portage Rd.) and it's one I use frequently). At the time I drove by I didn't realize a dead body had been found hidden and in a garbage bag. 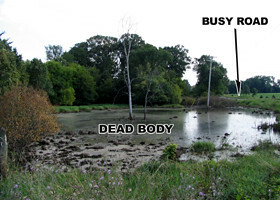 In subsequent days news spread that the body appeared to have been there awhile. Then it struck me. I had been driving by that dead body for quite some time. Creepy. Even now, a year later, it's difficult driving by that marsh realizing that that was the scene of someone's violent act. SoRRy AbouT That, SAM. I wAS loW on GAs AT thE tiMe so did NoT Have TIME to DuMP thE boDy FuRTher AwAY. MY DeepEST apoLOGiEs iF iT FriGHTenED You, MY frieND. CaN I TaKE You OuT To LUnCH To make IT up TO iT, Sam???????????? I laid in bed next to a dead body for about 3 years & didn't notice, so don't feel bad. As MUch aS i aPPreCiATE yOuR inVITaTIon typed like a ransom note I think the inkhead would be a much more suitable companion.